I am still trying to catch up on my reviews of the films from 2009 I’ve seen so far, though most of the time the flesh is willing, but the spirit is weak (or vice versa, I’m never quite sure which it is these days). I don’t know why I’m having problems putting my thoughts and opinions down. I never seem to have difficulty boring my friends about everything I’ve seen, but to pontificate on paper appears to be more of a trial for me than I thought it would. At any rate, the next set of critiques are going to focus on a series of foreign films I have recently seen. I’m going to say it and shame the devil. I find foreign films to be more fascinating, interesting, challenging (anyone have a Roget’s handy) than most of what is released in my own country. I’m no idiot, of course. I know if I lived in France, a large number of movies made there are often as boring, bland and just plain bad as those made locally by the usual suspects. But all in all, it is foreign films that get me to the multiplex these days. I don’t know why they are so superior. Maybe it’s the economic system under which they’re made which doesn’t require them to amass the same amount of profit as they do here (to paraphrase the Bible, the love of money is the root of all bad art). Maybe the themes and ideas that filmmakers from foreign shores are interested in have an audience they don’t here (Europe is the cradle of Existentialism, after all). Maybe familiarity breeds talent there (in the U.S. everyone wants to be the next Spielberg, whereas oversees you often get the idea everyone dreams of being the next Truffaut or Bunuel, or in today’s world, the next Almodovar or Haneke). But whatever the reason, this is where I find my film fix lately. I know I’m not the only one. I know that in spite of the fact when someone I know asks whether someone has seen anything good lately and I mention Revanche or Tokyo Sonata and a glazed look comes over their face as they quickly pretend not to hear me or they change the subject to District 9, I know that someone else also attends these movies. They must since these movies play here and I see other people in the audience besides me. But sometimes I do think it’s a lonely world out there. Of course, if I didn’t sound so pompous, maybe I wouldn’t alienate myself from others and they’d be more open to what I enjoy. But at any rate, here goes the first installment. 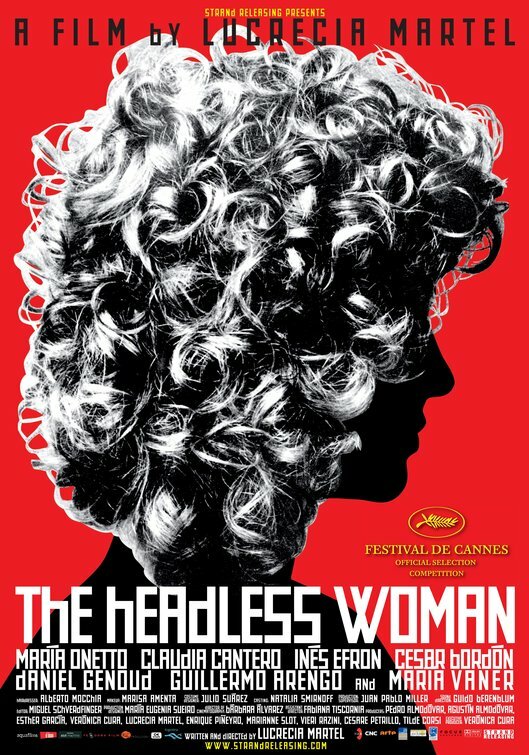 I saw The Headless Woman last year at the AFI film festival and it made the Howies, my list of the best films of the year (well, in this case the shorter list of films that were the best but only played one night stands at film festivals and such—I wasn’t sure whether I should include movies like that with my Howies, but since I couldn’t be sure, especially these days, that these films would ever open here, I went ahead and did it, even if it might screw up my list for the next year if they did open), Oh, and Maria Onetto made my best actress list. Whether one likes this film or not may depend on temperament. I found it incredibly engrossing, other people find it excruciatingly slow. In fact, The Headless Woman could actually be the sort of movie those friends of yours who won’t go with you to foreign films use as an example why. Onetto plays Veronica, a woman who accidentally hits something in the road and then begins acting oddly: she loses her memory, but tries to pretend as if she hasn’t. This may be the make or break section of the movie. If you don’t realize what is going on, it’s quite possible you will be bored and want to become headless yourself. If you do catch on, then you might find the suspense unbearable and the story line fascinating. When Veronica does recover her memory, she believes she might have hit a child with her car and the story then shows how her husband and lover work to first convince her she only hit a dog; and then when it seems she was right, show how the two cover up the accident. The moral quandary here is interesting. Veronica was involved in a hit and run, but she didn’t leave the scene maliciously—she lost her memory. You know the police will probably never believe her, so you end up hoping she gets away with it; at the same time, you feel a tad queasy at the idea of a crime going unpunished. In the end, though something highly melodramatic happened, there’s little melodrama or heavy breathing here, which again may alienate movie goers use to tent pole films or American film noir with numerous chase scenes and over the top action sequences. It’s a quiet film filled with quiet moments of quiet intensity. The writer director is Lucrecia Martel and I’m one of the few people who didn’t seem to care for her last film The Holy Girl, which I did find slow. What a difference a year can make. 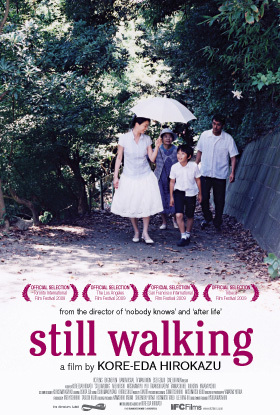 Still Walking is not necessarily the best title for a film. Whenever I think of it, I’m reminded of those scenes in movies where tourists are taken on a tour of the White House and the guide says “We’re walking, we’re walking”. And I’m still uncertain just what the title is suppose to tell us. But Still Walking, from Japan, may be another one of those movies friends use as the excuse they won’t go to something subtitled with you. It’s about a family that meets once a year to remember the passing of their oldest son who died while rescuing someone else from drowning. You might think, especially if you’re American, that there would be a lot of sturm and drang; but in actuality, it’s all still moments, unspoken grievances and repressed emotions. It’s a film that is about nothing, while being about everything. The conflicts are the familiar ones found in families everywhere: the daughter wants to move in with the parents to take care of them, but the mother doesn’t want it because it will be a nuisance and interfere in her routine; the father is distant father and the mother nips at the bottle a bit too much; and most central, the younger son has donned the difficult mantle of seniority now that the elder, but favorite, son has died, but he is also saddled with a father he can’t please. The most chilling scene is when the mother reveals the real reason she insists on inviting every year the man her son rescued, a pathetic, overweight, awkward, young slacker who can’t find his way in life. What seals the emotional punch is the off the cuff way she lets her son know. The Japanese family film in which the members don’t yell and scream at each other like the Tyrone’s of Long Day’s Journey Into Night, but instead live their conflicts quietly and with dignity (for better and for worse), is a Japanese subgenre all its own. The most famous practitioner of this sort of film known in the U.S. is probably Ozu. Here the writer/director is Hirokazu Koreeda, the creator of the heartbreakingly beautiful Afterlife and the moving Nobody Knows. Still Walking is one of the finest films of the year.